For a recent project, we worked closely with a client who had purchased a tired and run-down 1960’s era bungalow in Bournemouth. The client’s intention was to re-model and extend the bungalow into a family home, and they decided to enlist us to lend them a helping hand. Following initial consultations with our designated architects, plans were drawn up and submitted for planning approval. We then instructed a structural engineer to create designs as well as full working plans. These were then submitted for Building Regulations approval. Once we obtained permission to proceed, a detailed quotation was agreed, and work commenced with the project taking 7 months to complete. Before we could proceed with the conversion, the property had to be stripped out. This included all internal walls, windows, roofing, plasterboard ceilings, plumbing, heating, electrics, and kitchen and bathroom appliances. All of this was handled by us. 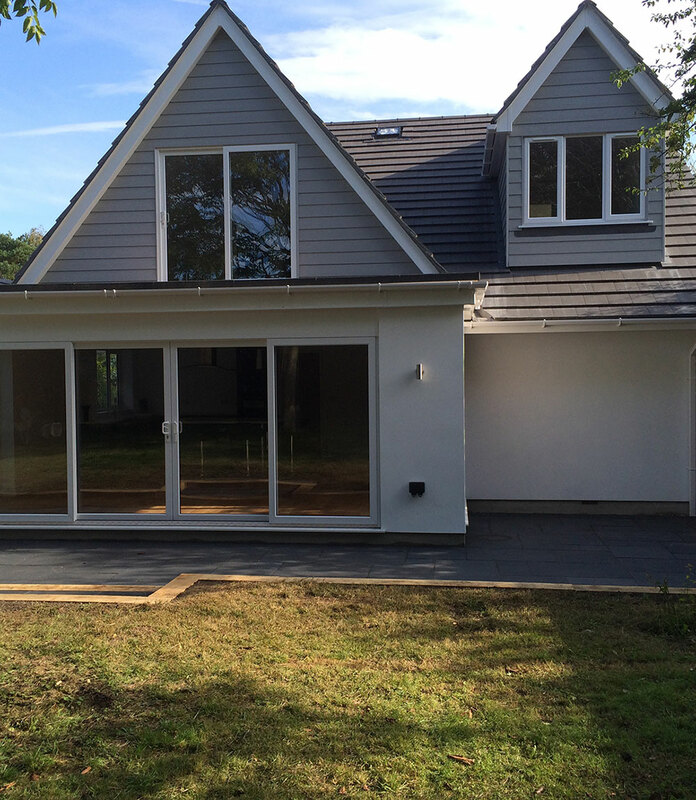 A 12m x 4m extension was then constructed to one side of the property. 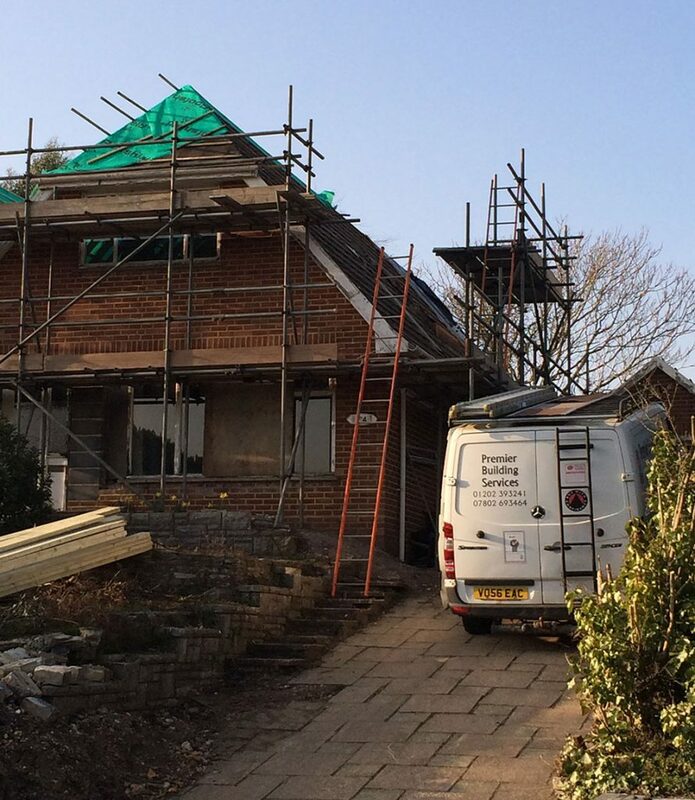 We then cut a new roof complete with gabled dormers and new gables on 3 sides. The purpose of this was to add 4 new bedrooms and 4 ensuites to the first-floor level. Next, we proceeded to fit new oak/ glass stairs complete with oak plank flooring that extended to ground level. UPVC windows and patio doors were also fitted along with a composite Anthracite front door. 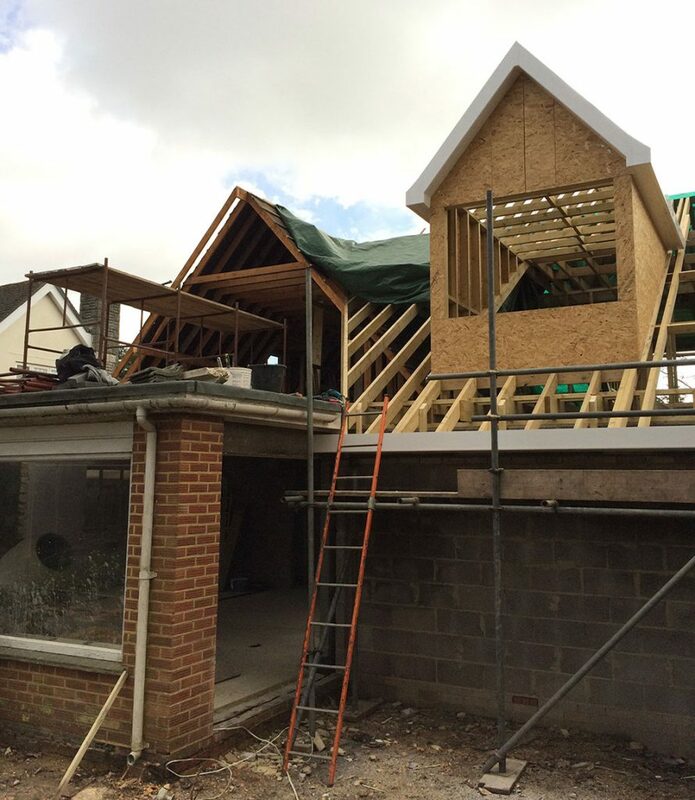 The exterior was then capped off with a new tiled roof. Inside, we installed new kitchen units, built-in appliances and quartz stone worktops. For the bathrooms, porcelain wall tiles, high-quality bath tubs, state-of-the-art showers and luxurious tiled floors were added. 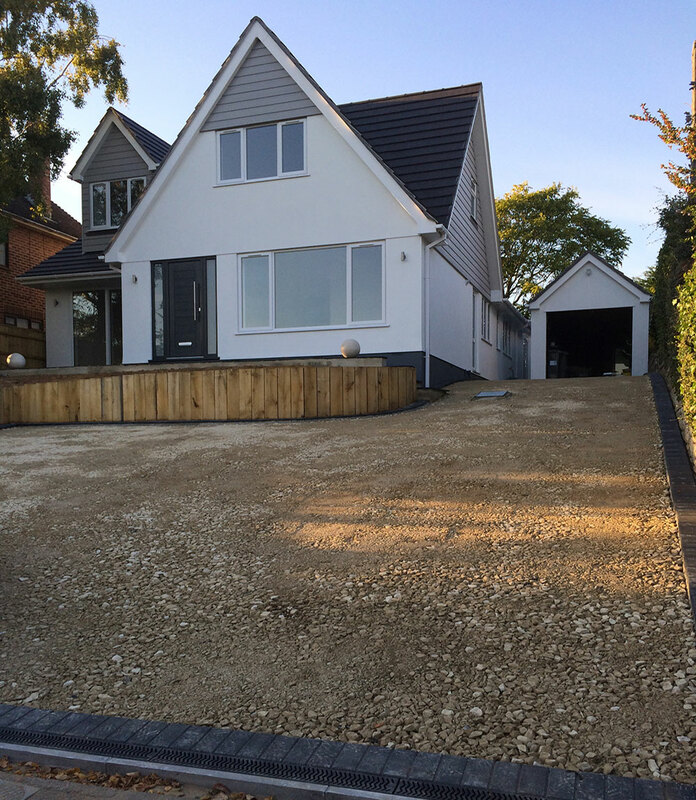 Outside, we removed 280 tonnes of soil from the front, tiered garden to allow for a larger driveway and parking area. Finally, charcoal limestone paving bordered with oak sleepers were incorporated to create wonderful paths and patio areas. At the project’s conclusion, we had successfully transformed a 2-bed Bungalow into a 5-bed Family Home complete with 5 bathrooms. If you’re interested in carrying out a similar project and are interested in hiring our team, call Premier Building Services today on 07802 693464.